Is an ADU Right For You? Although an ADU can be built for the sole purpose of obtaining extra income, or housing family members, they can also be used by the inhabitants of the main house. Giulietti/ Schouten designed ADU’s that double as artist studios and event spaces by working artists. Providing a separate and distinct space for an artist is crucial to the artistic process, and having that space next to the residence can increase creativity and productivity. If you are contemplating building an ADU on your property, but are unsure of renting it out, or have not obtained renters, then using it as a creative outlet, might be a great choice. Kristin Fritz is a local artist and client of Giulietti/Schouten. Since she works at home she required a private space in which to create, entertain and display her art. Beyond the functional requirements of a gallery and workspace, she wanted a space with visual and physical connections to the natural environment. The studio is nestled among large fir and cedar trees, but is oriented towards the pristine undeveloped corner of the site. This allows for an abundance of natural light and views to the forested exterior. 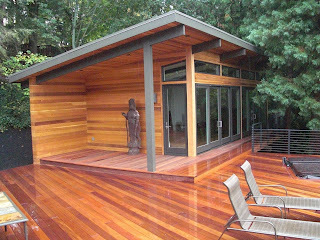 By using cedar siding and a post and beam aesthetic, the studio’s form and materiality are contextually in line with the existing home, located just across the deck. Now the client has a private, beautiful place to make and display her art, and is able to leave the studio without having to commute home. Another approach to a working studio is to transform a garage. This is the case with Tracie Broughton, another artist client. A new garage was created with a studio apartment (ADU) over the garage. The space is utilized as art and music studio, as well as a space to relax away from the rest of the home. In the case of client Marika vanAdelsberg, the studio was added after an initial home. She doesn’t have to go far to utilize her kiln or potter’s wheel, as the studio is directly next to the home, designating a specific space for the sole function of making art, which is important to any working artist. Today we are faced with many factors regarding population and space. Unfortunately as the amount of people continues to grow, the size of our planet does not. Thankfully, Oregon is one state that is taking measures to increase urban density and mitigate suburban sprawl, through the gaining popularity of allowing ADU’s, or Accessory Dwelling Units to be built on sites with an existing “main” residence. An Accessory Dwelling Unit can be created on almost any single-family residential lot in any of the 25 cities in the Metro area. It can be attached, such as over a garage, or detached, as in a separate living unit in the same plot as your home. ADU’s are limited to be no greater than 800 square feet, and smaller than the existing house. “Granny flat” or “basement apartment” are also names for ADU’s. An ADU is a great way to help reflect the changing needs of homeowners, especially with the increase of one and two person family units. They can provide added source of income, through renting, as well as allowing the family to be closer, if a grandparent or other family member moves in. According to the Department of Environmental Quality (DEQ), reducing housing size is “the most effective way to reduce both material and energy related impacts of residential homes.” Smaller homes use fewer materials, less energy, create less waste, and increase density within the city. By containing the sprawl of new construction, we can induce more significant change in energy used per capita. There are some simple steps to follow if you are considering building an ADU, or are trying to figure out if it is the right decision. Funding, of course is a major factor in any new construction. There are new incentives offered through the Energy Trust of Oregon (ETO), as they have allowed detached ADU’s to qualify for full home incentives. A rebate check of up to 4,000 dollars can be obtained for highly energy efficient homes. Talking to city planners and visiting the planning and zoning staff at the cities Development Services Center is also important, considering you may need an inspection of the existing structure. Acquiring an architect to help with the design and plans is also crucial. Finding a builder as well as various subcontractors is important; plumbing, mechanical, and electrical are three you will definitely need. Providing the city with drawings and subsequently obtaining a permit for construction is the final step before building can begin. 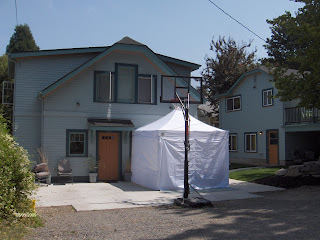 If you think that building an ADU is the right choice for you and your family there are a few websites that can help you to easily analyze your decision as well as getting started. The following are three specific to the city of Portland. Also on October 26 there is going to be a summit called “Build Small/Live Large: A Market Revival for Single Family Housing.” Builders, developers, designers, and real estate professionals will be discussing many topics including; ADU’s, demographic shifts, financing, incentives, zoning, policy, and small housing trends.